When you experience a pain when working out, you may wonder what kind of injury you have actually incurred. Most often, you’ll have a sprain or a strain of your muscle. How do you know the difference and how do you treat them? A sprain is a stretch and/or tear of a ligament. A ligament is the fibrous band of connective tissue that joins the ends two bones together. Ligaments stabilize and support the body's joints. For example, ligaments in the knee connect the upper leg with the lower leg, enabling people to walk and run. 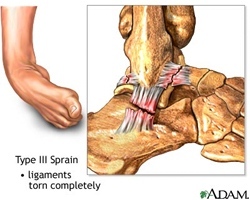 A sprain is caused by direct or indirect trauma that knocks a joint out of position, overstretches it or, in severe cases, ruptures the supporting ligaments. Typically, this injury occurs when an individual falls and lands on an outstretched arm, the side of the foot or runs on an uneven surface. Symptoms of a sprain include: pain, bruising, swelling, and inflammation. The individual oftentimes feels a tear or pop in the joint. In severe cases this may make the joint nonfunctional. In other cases, where the sprain partially tears the ligament, some swelling may occur. A strain is an injury of a muscle or tendon. Tendons are fibrous cords of tissue that attach muscles to bone. There is no way to make yourself immune to sprains and strains, but proper stretching, appropriate footwear and warming up before engaging in physical activity will help alleviate these potential problems.